One of the things I get recipe requests for the most is pork chops. It seems beyond frying and baking people are at a loss. Not to mention we all get bored of the same ol' thing all the time, and we want to spice it up. I'll be honest, pork is not one of my favorite things, but my husbands LOVES it. So when I was thinking of something special to make for him I knew I wanted to use some of his most loved ingredients...mushrooms and pork chops. To begin you will take a skillet, I recommend using cast iron if you can, and place over medium/high heat. Add the butter and oil and allow the pan to get hot. Place the salt, pepper, garlic powder, and Italian seasoning in a small dish and mix together. Seasoning the pork chops LIBERALLY on both sides. When the pan is hot you are going to brown the pork chops on each side for 2-3 minutes. Take a moment to nestle them in between the pork chops. Pour the broth into the pan. You can use any kind of broth you like, chicken, vegetable, beef. Water will even work if you don't have any on hand. Add the dried minced onions to the pan. You can, of course, use regular onion, but I just find that this adds great flavor without overpowering the sauce. Bring the broth to a simmer, cover, and let cook for 20 minutes unto the pork chops are fully cooked. 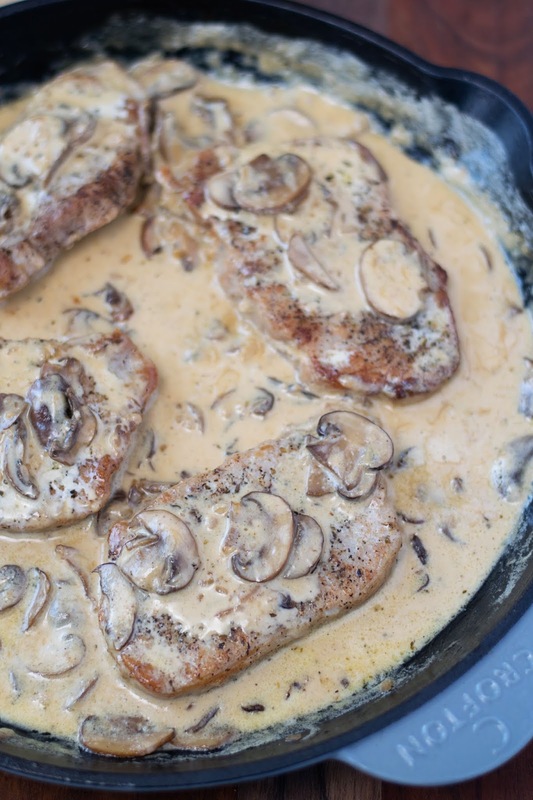 While the pork chops are simmering place your heavy cream out on the counter to come to room temperature. This helps the cream thicken and not curdle in the pan. After 20 minutes your pork chops will be fully cooked and the broth reduced by half in the pan. Pour in the heavy cream. Bring the heavy cream to a simmer and let thicken for 5-10 minutes. You are looking for a beautiful thick and silky texture. 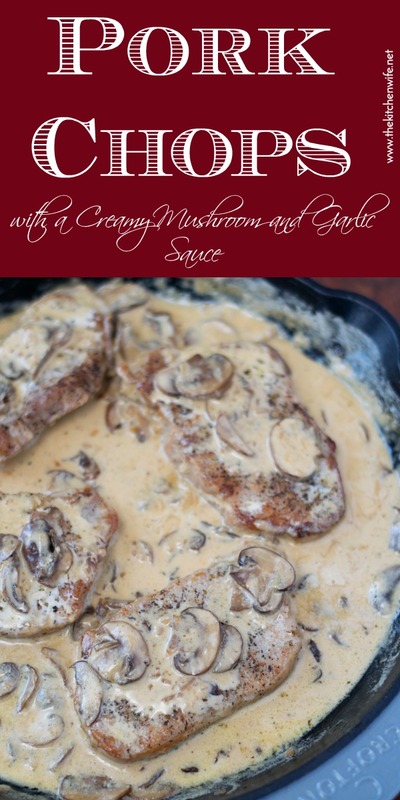 And there you have it, phenomenal Pork Chops with a Creamy Mushroom and Garlic Sauce. The pork chops themselves are so tender that my husband was cutting them with his fork. They were super juicy as well, not dry at all. 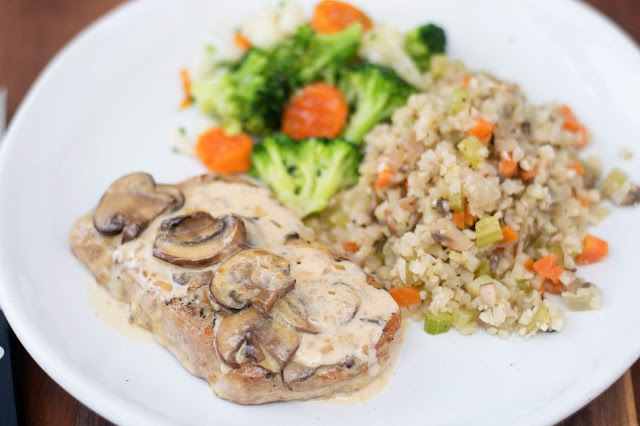 I served my Pork Chops with a Creamy Mushroom and Garlic Sauce with a side of my cauliflower "wild rice" and some steamed vegetables to keep it low carb, but this would be AMAZING with some great mashed potatoes! No matter how you choose to serve it I know you're gonna love it so get in the kitchen and give it a try tonight! These Pork Chops with a Creamy Mushroom and Garlic Sauce are sure to be a hit around the family table. 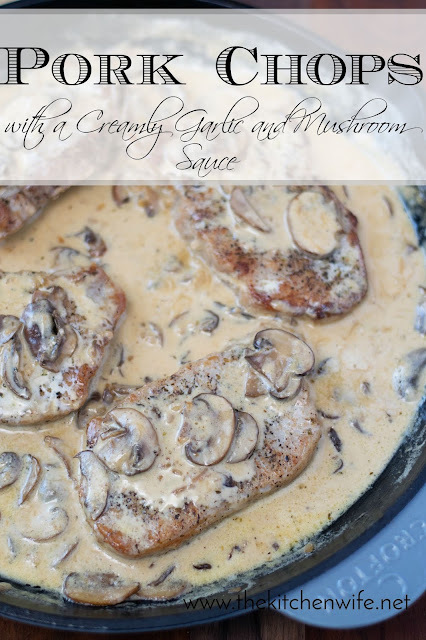 The simple mushroom and garlic sauce is so easy anyone can make it! Place the skillet over medium/high heat and add the butter and oil. Allow the Allow the pan to get hot. Combine the salt, pepper, garlic powder, and Italian seasoning in a small dish LIBERALLY season the pork chops on both sides. Brown the pork chops in the pan on both sides for 2-3 minutes per side. Pour in the broth, add the dried minced onion, bring to a simmer, cover, and cook for 20 minutes. After 20 minutes remove the cover and pour in the heavy cream. Simmer for 5-10 minutes to allow the sauce to thicken.